Quality products all about rhinestones! Made of bling rhinestones in multiple colors & different shapes, the items must be the first choice for your business. Well given consideration to comfort as well as beauty on women's t-shirts, we pay more attention on combining soft fabric and amazing sparkling hotfix transfers. Bling graphic tees for women with funny slogans or sayings, simple or fancy patterns can give a perfect expression whatever in casual or slim fits. Quality t-shirts for women, which is our extensive production based on hotfix tranfer making, can meet wholesale order now. Besides large stock men's t-shirts, CSTOWN offers custom men's tee shirts as well. 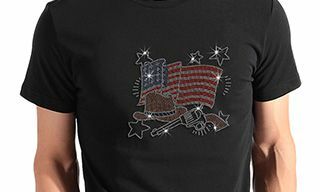 The t-shirts employing 100% cotton can completely provides a comfortable, casual wear experience. 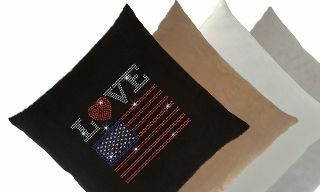 With 10 years experience in rhinestone transfer industry, CSTOWN develop production lines to bling throw pillows with custom rhinestone transfer designs.